It was my pleasure to read and review this book by Helen MacKinven; it is not my usual crime/psychological thriller type of read but it was one well worth stepping out of my comfort zone to delve into! Are you looking for a Scottish read that will transport you right inside the heads of two very different women with one common aim? One that will have you reminiscing over friendships, bad relationship choices and the quandaries that life throws at us all? A bittersweet and poignant read laced with that well-known Glasgow gallows humour? Then pick up Buy Buy Baby and give it a go! Carol and Julia are two very different women but they have one thing in common, they both are yearning for a baby. Just how far are they prepared to go to make that dream come true? Buy Buy Baby is the story of these two women whose circumstances are very different – Carol is divorced and in pieces following the death of her son, Ben; she is in debt and has no idea just how much longer she is going to be able to survive; Julia is a career woman whose biological clock is ticking and is close to exploding; being a devoted aunt to her niece Holly is no longer enough and she wants her own child. In steps Dan, Dan has a plan – but what will the cost be to each of the women and are they prepared to go through with it? This is NOT a fast paced, wham bam, explosive kind of read – ok, it’s not a psychological thriller and there is no police procedurals to get your heart racing! Just throwing that out there as you all know that is my go-to choice for fiction! Instead Bye Bye Baby has just given me a fabulous journey alongside two very different, but essentially very Scottish and indeed Glaswegian women who have their mindset on just one thing…a baby! But it is not a chick-lit kind of read either – I’m not quite sure where in the genres I’d place this one but I can tell you this it earned a special place in my heart’s reading shelf that’s for sure! Carol and Julia – two very different women but I warmed to them both immediately; their vulnerability was clear despite the way they both covered it up and there was something about them both that I could see in myself and indeed in many women I know. It was kind of like crawling into the heads of your best pals and going on a night out with them; I found myself laughing with them, wanting to cry with them and wanting to knock Dan into next year with them too! What a sleaze ball he is! This is an excellent example of a character driven novel; of course, the plot is important but the characters are the driving force of Bye Bye Baby. I’m sure you can all relate to much of the scenarios in this book – talking to your dog (and answering back for it! ); crying into your drink over the disasters that have happened to you; coming across that group of every so bitchy women – you know the yummy mummies who make it all look so effortless while you struggle by with your hair plastered to your head and yesterday’s makeup trying to pretend you are doing #gothicchic! Yes, there was so much of each woman’s character that I could identify with which made it a compelling read for me. Buy Buy Baby explored the complexities of female relationships, parenthood, grief, domestic abuse and heartbreak but with a special twist of humour added that gave it that little extra oomph! As well as the characters, this novel gave me something that I adore – that sense of place – set in and around Glasgow, the author uses fictional names for the towns but oh I sooooo recognised them indeed I am sure one of them is right next to me and the woodland walk just reminds me so much of the walk that I take my dog! So every page I turned I felt that not only was I inside the head of the character, I was also in the very location with them and this is always a bonus for me! There is lots of local dialects Glaswegian and Doric (as Carol is originally from the North East of Scotland) but this is easy to work out in the context of the conversations and it added to the authenticity of the book for me. I’m not really sure what I’ve told you about the book in this review, other than I completely gelled with the characters and the places; it made me snotty with laughter and with tears. It doesn’t give you all the answers and leaves you with dilemmas to ponder but sometimes in life, it is good to have something to think about! Born in Falkirk, I spent my childhood and most of my adult years in Bonnybridge, Stirlingshire. But after watching one too many episodes of Escape to the Country, I moved to a three hundred year old cottage in a small rural village in North Lanarkshire to live with my husband. I have two grown-up sons but I have filled my empty nest with two dogs, two pygmy goats, four peachicks and an ever-changing number of chickens. As well as being a writer, I also work in schools across Scotland as a literacy consultant with The Learning Zoo delivering training to teachers in the Reflective Reading programme. I was recently a Scottish Book Trust writer-in-residence at Levenmouth Academy in Fife working senior pupils. Great review. I loved this book for all the reasons you did, it’s just brilliant. 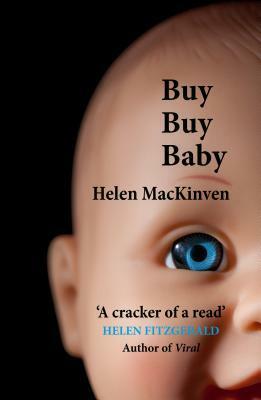 Really chuffed with this review of Buy Buy Baby!